Really good espresso for the price! I really love the espresso from this machine. I wanted a $500+ machine but just couldn't justify spending that much on an espresso machine; I was quitting SBucks to save money. After reading the reviews, I decided on this one. I was pleasantly surprised. It's ridiculously easy to use, makes really good espresso and is easy to clean (if you don;t use the frother). I would have given 5 stars but I didn't have much luck with the frother. It didn't seam to get hot enough to properly froth the milk and it was hard to clean. I bought a separate frother and still saved a ton of money. Great buy! Mr. Coffee Pump Espresso, Cappuccino, & Latte Machine is the best coffee maker I ever used in my life , it's my second coffee maker I have , the first coffee maker I have was nesspresso coffee maker , I buyed it to the office because I'm an espresso man , but it only makes Espresso at home the case is different , my wife is a cappuccino lady and sometimes guists visit us like latte , Mr. Coffee Pump Espresso, Cappuccino, & Latte Machine solved this problem , only one machine will give you and your guests all the three options , you will act like a professional chief in the best coffee shops , to make the best delicious , best rich coffee , now I will mention some of the advantages of Mr. Coffee Pump Espresso, Cappuccino, & Latte Machine , firstly Mr. Coffee Pump Espresso, Cappuccino, & Latte Machine is very easy to clean , the outer body Neve made finger print , water is quite enough to clean it up , Mr. Coffee Pump Espresso, Cappuccino, & Latte Machine is very easy to use , instructions come with it and will learn you the very easy steps to make your perfect coffee , Mr. Coffee Pump Espresso, Cappuccino, & Latte Machine adds Avery good flavor to the coffee , and coffee you will get from it is very tasty , delicious and rich , Mr. Coffee Pump Espresso, Cappuccino, & Latte Machine is very quick and will help you specially when you have guists , it's the best time to use it and you will be very grateful to it it will give you great help in this time ,Mr. Coffee Pump Espresso, Cappuccino, & Latte Machine have a very large water container, the best advantage I found in Mr. Coffee Pump Espresso,Cappuccino, & Latte Machine which I found its much bitter than nesspresso , Mr. Coffee Pump Espresso, Cappuccino, & Latte Machine is very quite and hardly you can hear it's sound , you can use Mr. Coffee Pump Espresso, Cappuccino, & Latte Machine all the times but I can't go to my work without my morning coffee from Mr. Coffee Pump Espresso, Cappuccino, & Latte Machine, I love it. Me oh my, this machine is not for the faint of heart about coffee. I have somewhat been faint of heart about coffee - at least somewhat until more recently. Mr Coffee Pump Expresso Machine is amazing. I have learned to make almost effortless Espresso's from my home without the big ticket prices of the best coffee shops. I like that I don't have to make 2 cups at once. It also has a built in milk frother and a removable drip tray and two separate coffee baskets as well. Although it has two baskets, you don't have to make two cups each time. Be sure to line up your cup with it's coffee stream. It's helpful to center one cup under both holes if you want to make a single cup at a time. I was slightly let down that it does not take coffee pods because they used to be my favorite. I now realize that I actually save money by using ground coffee anyway so that wasn't such an awful thing after all. last but not least, it is excellent at frothing milk and leaving that delicious creme cap that I absolutely love. Love the Mr. Coffee Pump for Espresso, Cappuccino and Latte's! It is so fun, and easy to use and makes delicious coffees, no matter what your preference is. 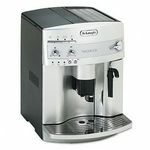 I am usually a cappuccino lady, but after trying the latte and espresso from this machine I really like them as well. So its nice to be able to mix it up a little. This is really easy to set up and use and awesome for when you have guests to give them the option of a personalized coffee. Its a big hit. I would recommend it for anyone who loves coffee or entertaining. Brew Performance Nice brew and quick. Ease of Cleaning Simple and pretty quick to clean. Ease of Use Easy to use and the directions explain everything you need to know. Design The design is very modern, sleek, and attractive. Impresses everyone who comes over to my home. Durability I have not had mine for too long yet, but I am sure with care there will be no problem with durability. I do not use it everyday either so that should affect durability. This coffee machine is a dream come true. It gives my home the most comforting aroma of brewed coffee. It makes my espressos, cappuccinos, and lattes like the any of the ones I would order at a coffee shop. It is also greta for entertaining friends and guests and for those special holiday times. My personal favorite is the latte performance. The machine is durable and has been giving me great coffee drinks for over two years now. The coffee maker is very simple and easy to clean. The inside and outside are both easy to clean. Making the lattes and cappuccinos can be messy but it is worth is when drinking them and sharing them. This machine is a great gift for anyone. especially for those who love their coffee. The machine also makes my kitchen looks classy and modern. Coffee is a hobby and relaxation of mine, and this wonderful machine has made my life a lot more relaxing. I received this machine as a wedding gift. I love espresso but hate going to a coffee shop and paying coffee shop prices in order to get that lovely taste. This Brew Performance I love that you can have different strengths and make different drinks. I almost felt like I was back in Italy. Ease of Cleaning This is decently easy to clean but I worry about the bottom portion and how clean it is really getting. Ease of Use This is probably one of the easiest espresso/cappuccino machines out there. It does take some getting used to and reading instructions the first few times you use it, but once you get the hang of it, you'll be making them quicker then your favorite barista at a coffee shop. Design This product has a great design. I love that it is fairly compact and can easily fit on my limited counter space. It has a fairly sleek look, something you don't mind leaving out. Durability This unit is very durable. While I do like leaving it out, I have limited counter space, so this unit often gets moved from on the counter to under the counter and sometimes even onto shelves in the basement. So it gets moved around (and occasionally dropped). It holds up well and still works fine. 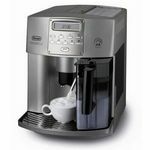 I really enjoy my Mr. Coffee pump espresso, cappuccino, and latte machine. It works so well, to me, it works like one of the very expensive one's do. 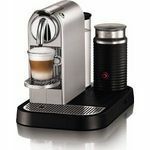 I love how it can make so many different things, it makes espresso, and can steam and froth milk which is wonderful! You do have to learn how to mix different amounts of espresso and steamed or frothed milk to get what you want but once you get it, it's really not that confusing. You can either use one cup for a serving and just place the one cup in the center, or you can make two servings by putting two cups in the allotted places for them. It's simple to clean out, the tray just slides out and you can simply clean it that way. A great thing about this is that it's so simple to use, it's also a great size it's nice and compact unlike some of them out there that can be huge. You do have to manually tell the machine when to stop dripping when using milk so you do have to get used to that so make sure to practice doing so. 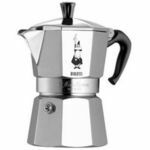 It heats up very quickly, which is great to have with an espresso maker as well. Brew Performance This espresso machine brews so well, it's very fast and produces a good brew every time. Ease of Cleaning Very simple to clean, any part of it that requires cleaning easily pops off and you just wash it off just like that. Ease of Use It's very easy to use, now like I said above, you do have to manually tell the machine when to stop dripping the milk so you have to be careful with that, and you do have to know how much of what to add to get lattes and such but it's still really simple once you get the hang of it. Design Great design, I love how compact it is so it doesn't take up a ton of room on your counter. Durability Very durable product, I haven't had any issues out of it yet. I love coffee more than life itself! I absolutely love coffee maybe a teeny bit too much, but being a full time mother, home maker, house wife, and running my own business, I think that drinking coffee is a better stress reliever than some other things people do. This espresso machine is just perfect for when it is just me wanting a nice, rich, smooth, and delectable cup of hot steaming coffee. Unfortunately for my husband, I have a hands off rule when it comes to my espresso maker, for good reason though he broke our last one. Although, I am glad that he did break it because if he didn't, then I wouldn't have this amazing contraption! I love this specific espresso machine more than the others because it does more than most espresso machines, like our last one didn't even steam milk properly. 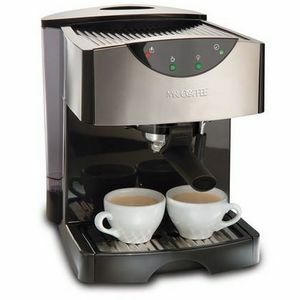 This espresso machine is more than an espresso machine, it is a day-maker, it can make crappy coffee taste good, make one heck of a latte, steam milk to perfection, make espressos and cappuccinos, and make an awful morning into a positive, can-do attitude. I don't know what could possibly be better about this machine! Brew Performance Absolutely delicious! Best cups of espresso, cappuccino, latte, and coffee I have ever had and probably will EVER have. I don't even bother going to a coffee shop anymore because this machine makes way better coffee than any coffee shop. Ease of Cleaning You rarely even have to clean this at all, but when you do it is very simple, and you really don't have to do anything. 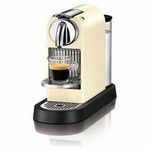 Makes great Espresso and Cappuccino! We got this as a wedding gift about two years ago. It has been a great addition to our home. We make cappuccino with is frequently. We also have made espresso on it. It brews great coffee and it pretty easy to use. I would recommend this product! Brew Performance It hasn't made anything that wasn't delightful yet. We did buy a milk frother separate for when we make cappuccino. We really enjoy this machine and making espresso and cappuccino with it. Ease of Cleaning This would be my only downfall to this. I don't think it is the easiest machine to clean. I like for my appliances to look really clean and the bottom of this machine has gotten coffee stains on it. I have a difficult time getting them off. Ease of Use Easy to use. It takes a minute to do it and only makes limited quantities at once. However, the outcome is worth the patience required. Design Great design. It holds two cups at the bottom and has a classy look to it. Fits well with our other appliances. Durability No problems in two years of using it!